Rule 98 of the Highway Code addresses towing. In order to tow a trailer or caravan you will need a tow ball (also called a tow bar, tow hitch or trailer hitch). 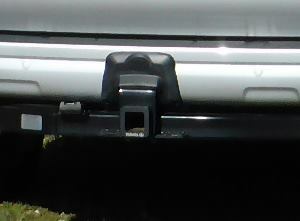 For cars, these are predominantly of two types: a fixed tow ball attached to the chassis, or a removable tow ball or other type of connector that’s fastened through what’s called a receiver which will be Class I, II, III or IV (pictured). To the left of the receiver you can see a small flap which you lift up and plug in the cable for the lights. Trailers come in two main types: braked and unbraked. An unbraked trailer has no brakes on the trailers wheels. Typically the maximum unbraked trailer weight that you can pull is 750kg, but it will be less if your car is small. On a braked trailer typical weights range from 1500-3500kg depending on the type of vehicle. The towing receiver pictured above is a Class IV and is fitted to a large Toyota SUV which is capable of pulling 2800kg. Motorbikes are only allowed to tow a trailer up to 1m wide. Don’t forget that if you are towing a trailer that you won’t be able to filter through traffic. The gearbox must be strong enough and have the right gearing to be able to cope with towing. Usually a manual car is capable of towing more than an automatic, but this does depend on the clutch. Too much pressure through the clutch will make it slip, and too much stress through the gearbox could cause the fluid to overheat, strip the teeth off the cogs, or do some other damage. A vehicle’s chassis must have the rigidity to be able to cope with a heavy weight exerting force on it. Under acceleration uphill, for example, a heavy trailer will exert a backwards force on the car which could stretch the chassis. Modern disc brakes are capable of dissipating quite a lot of heat and providing a good level of braking force. However, the reason why unbraked trailers are generally limited to 750kg is because this is an extra 750kg of force that the front brakes must deal with, often on top of additional luggage and people within the car. It is easy to overheat your brakes and suffer brake fade on a long downhill slope when towing a trailer. Check our article here on brake fade. Torque is the main consideration for whether a car is capable of towing a large trailer. Torque is the turning force exerted on the wheels. Tractors and trucks have huge amounts of torque in relation to their horsepower – often multiples more, whereas the torque and power of a road car are more similar. If there is no enough torque there’s a risk that the car will be incapable of moving a trailer, or may run out of ability to move forwards on an uphill stretch. Light cars can be more prone to being negatively affected by the movement of a trailer. For example, in a side wind, a caravan can have a lot of side ways force exerted on it. An extremely light car may not have the mass to keep the caravan under control. As per the rule, there must be some downwards pressure on the tow ball to avoid the rear wheels being lifted which could cause the trailer to jack knife. Tow ball manufacturers will give the maximum weight allowed on the tow ball. Ensure that your trailer’s tyres have the correct pressure, that the rear light clusters work, that there is no rust, and if it has brakes that the brakes are working. If your trailer is open then you will need equipment to tie loads down. If your trailer is closed, ensure that the latches and locks on the rear are working correctly and not likely to burst open. When you hitch your trailer always attach the safety chain. When pulling a trailer drivers should consider the swept path of the rearmost wheels. These will cut the corner and therefore the driver should swing out wider than usual in a corner or when entering/exiting a driveway. On a trailer with a large rear overhang, the rear corner will pivot wider than the path the rear wheels take, too. Your car might have trailer sway mitigation (part of some electronic stability control packages) which helps stabilise the car if the trailer starts wobbling, or swinging from side-to-side. If it doesn’t, the best way to deal with this is to simply take your foot off the accelerator. Don’t brake unless you absolutely have to. The trailer will come back into line as the speed drops. Keep a tight hold of the wheel and don’t make any sudden movements that could worsen the situation. Rule 98 doesn’t mention lights, but don’t forget that your trailer must have working indicators, brake lights, reversing light and rear lights to be legal. Most people can’t answer these 15 questions about vehicle loading correctly. Can you? Try them here.